The most common concerns and questions one is confronted with as a vegan and particularly as parents to vegan children relate to the supply of certain nutrients. Even if deep down you feel that you provide your family with all they need and everything works well, it still helps to have some facts on hand for these discussions. I have collected some useful information concerning the topics most frequently thrown at me. If you feel like there’s anything amiss, please don’t hesitate to drop me a line so i can add it to the list. Certainly the most common concern when it comes to nutrients and vegan diets circles around the topic of protein supply. Given the fact that it is precisely the animal protein that is scientifically linked to cause cancer, this seems absurd. But in the collective consciousness the importance of animal protein and animal products as its source are deeply rooted. These beliefs are not without merit: animal products do offer the full spectrum of proteins; they contain all 9 essential amino acids (those that our body cannot produce for itself). Altogether there are 20 amino acids and our body uses those in order to form proteins, as does every (other) animal and plant. Since plants build a different set of proteins than animals, not all essential amino acids may be present in sufficient form, which is why they are called incomplete proteins. However, in order to build its own proteins, our body requires a full set of amino acids. In the absence of one specific acid of those initially listed in the blueprint, the entire production will be stopped. First of all, there are plants carrying all major acids in sufficient quantities. Secondly, you can cleverly combine plant-based foods to compensate for deficits. Although beans are a good source of protein, they lack in methionine. This can be easily compensated with grain, which in turn lacks lysine. 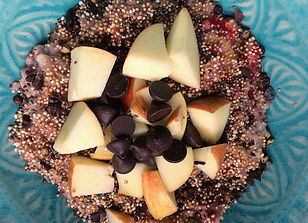 Meaning, have regular helpings of your morning bowl with amaranth, chia seeds and gojis. 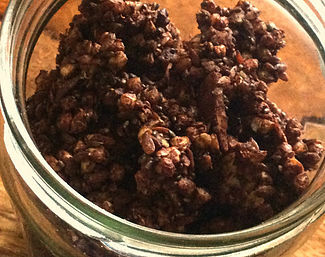 Feast on buckwheat granola. 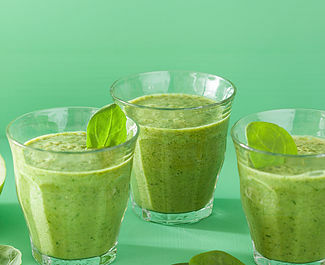 Add some chlorella to your smoothie. 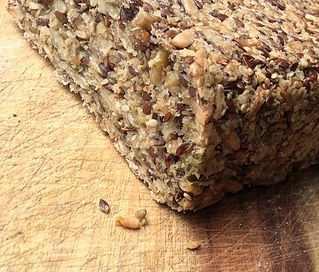 Enjoy bread with seeds and nuts, take a look at the buckwheat crackers. Serve a delicious chili with rice (recipe following in autumn). 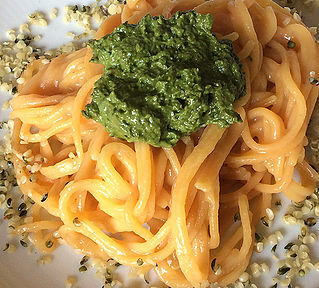 Or sprinkle some hemp seeds atop your pasta. For a vegan, full-fledged protein intake is easy. In fact, how does the iron get into the meat? Via animals consuming plants that have incorporated the mineral from the earth through their roots. Which means that we can skip the intermediate step and help ourselves directly from the plants. Leading sources are pumpkin seeds, sesame, amaranth, quinoa, millet, flaxseeds, sunflower seeds or basil. Green leafy vegetables such as mangold, spinach, plantain, purslane, nettles, watercress, dandelion, lamb’s lettuce etc. are also good herbal sources of iron. Your plate doesn’t have to be covered in green, the color of beetroot and goji berries lets you guess what these two can bring to the table concerning blood formation. When it comes to spices, turmeric and cinnamon provide us with an abundance of iron. And many legumes also contain noteworthy amounts of it. So does leek. Amaranth on your morning bowl, followed by a fresh apple-red beetroot juice (recipe following in winter). Lentil spaghetti with wild herb pesto (made from spinach, basil, nettle, sunflower seeds) for lunch. 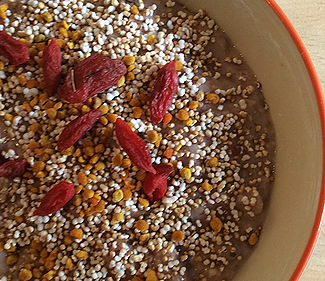 For a snack: a green smoothie with goji berries. 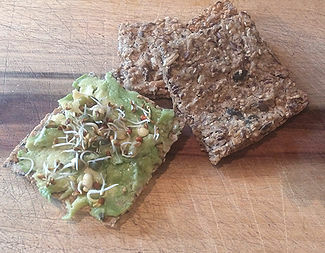 Seed bread with avocado and cress in the evening. 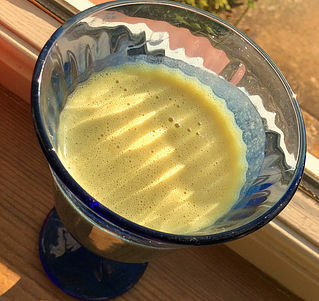 A delicious cinnamon turmeric slumber milk to wrap things up. Now that does sound a little more mouthwatering than a day of black pudding, doesn’t it. If you want to further promote the absorption of iron, it helps to eat iron-rich foods along with vitamin C, fermented products, acidic foods or sulphurous amino acids. On the other hand, raw cereals along with tea, coffee and milk, egg and soy have a rather inhibiting effect on the uptake of iron. Milk as the most important supplier of calcium and therefore particularly suitable for children and bones is another piece of common general knowledge. In actual fact, the aforementioned China Study is not the only scientific proof to the opposite: In countries with rising milk consumption, there is an accompanying increase in osteoporosis disease. This is partly due to the animal protein (particularly high in milk) which can impede the absorption of calcium. Just like iron, calcium is a mineral that is present in the soil and is absorbed by the roots of plants. 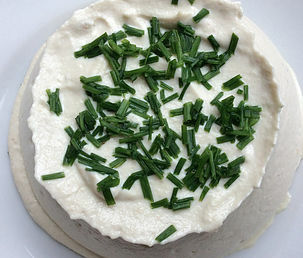 Animals get their calcium by eating these calcium-rich plants. Which means it is a misconception that calcium stems from milk, the actual origin lies in the earth. So again, to absorb calcium directly from its plant host would be easy as pie. The all-rounders, namely morning bowl and green smoothie again proof very helpful, especially if the smoothie contains kale or broccoli (use only frozen!). 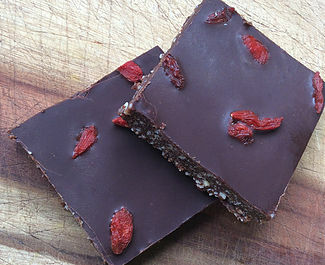 How about a delicious raw brownie (dates, almonds, goji) instead of the daily glass of milk? I can imagine worse… And your kids will love you! B12 is produced by bacteria existing, for example, in the intestines of animals and humans. Unfortunately, in the human gut their place of business is so far towards the end, we cannot use our own source of B12; hence the practice of some animals to eat their own poo. But does that mean you actually have to eat others’ waste products? For a tastier alternative there’s algae, for example. 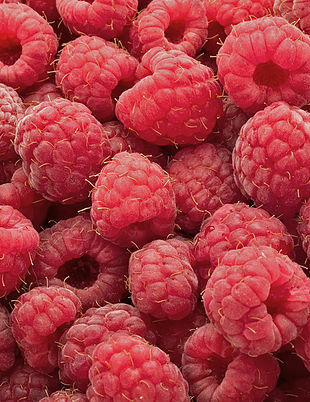 They contain bio-available vitamin B12, albeit in smallish quantities. But chlorella inside your smoothie is definitely a good start. Spirulina, however, often traded as B12 supplier and a popular super-food, should be avoided by vegans. The reason? Spirulina only contains the so-called B12-analogues. These analogues do not fulfill the same functions as true B12, but they do block the body’s receptors. That way, true B12 can no longer be ingested. In actual fact, the easiest way to satisfy your B12 needs as a vegan are B12 supplements. 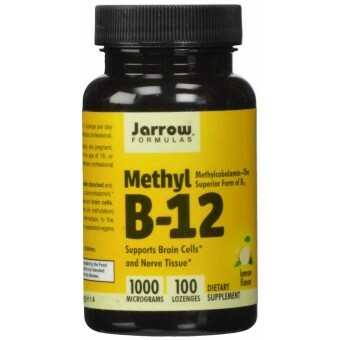 Make sure you buy quality products that contain methylcobalamin; this is the bio-available B12 variant that supplies the brain, nerves and blood. We take these and are very satisfied. 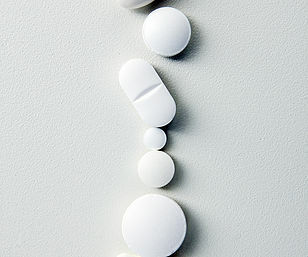 Inside your body, B12 and folic acid work closely together. Folic acid intake is a general issue; especially during pregnancy even omnivores are universally prescribed with supplements. The best folate supplier of all, and by far a better source than the leading animal product (beef liver with 590μg / 100 g): nutritional yeast! Depending on the manufacturer, it contains up to 4000μg / 100g. I find it almost hard to imagine a day where none of these sources of folic acid would be featured on our meal plan anyway! For those unfamiliar with wheat germ, the ones by Amanprana are a great choice. 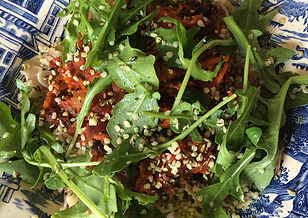 Sprinkle them onto your morning bowl followed by a green smoothie kale and spinach, snack on buckwheat crackers (sunflower seeds) with peanut butter or cashew cheese (nutritional yeast) and for dinner a rice dish with humus and parsley. Done! Which is exactly how I managed to live through my pregnancies without folic acid tablets and without a deficiency. While saturated and monounsaturated fatty acids can be produced by the body itself, the polyunsaturated fatty acids linoleic acid (omega-6 fatty acid) and α-linolenic acid (omega-3 fatty acid) have to be supplied through your diet and are therefore referred to as essential. The ratio of omega-3 to omega-6 is crucial and the majority of foods show an unfavorable amount of omega-6. For this reason, fish seems to act as a sort of last bastion when converting to a plant-based diet. Supposedly, the vital omega-3 acids can only be obtained through fish consumption. In principle, all foods offer their highest level of nutrient and vitamin content when enjoyed raw. 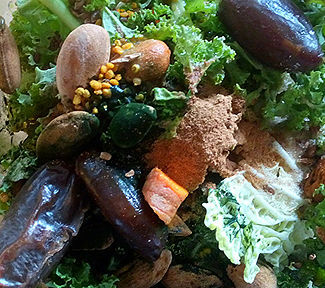 It therefore makes sense to integrate as much raw foods as possible into your meal plan. That’s a given when it comes to fruits, but greens in the form of salads and smoothies are an equally vital part of a balanced diet. But: Raw food is also much more difficult to digest. And since the digestive activity of the stomach and intestines decreases during the day, you should abstain from raw foods in the evening. Starting in the afternoon, your stomach is producing less and less acid. 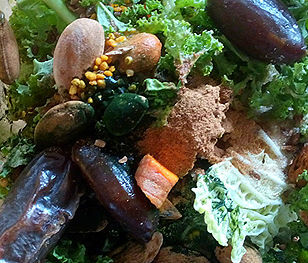 Raw food then reaches your intestines only half-digested (or not at all! ), which can lead to fermentation processes and harm your liver – without any intake of alcohol! This problem is easy to circumvent by adhering to the rule of thumb to only eat raw food until 4pm. 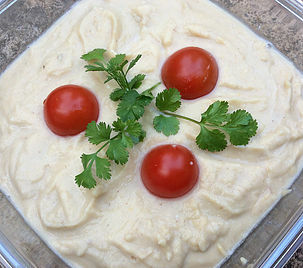 Exempt from this rule are avocados, their high level of fat keeps them from fermenting… Having a “light” salad in the evening, however, is unfortunately not a good idea because what seems like an easy choice is actually pretty hard on your liver.